This subject is slightly "off-topic" in that it does not concern politics. It is "on topic" in that it involves a crisis of conscience (conscience and ethics being the center of libertarianism) and also in that religion and politics are held by many libertarians to be the same phenomenon. I've recently read the book "Holy Hell" by Gail Tredwell. Tredwell was for two decades the chief attendant to the very popular Hindu spiritual guru Ammachi. The book chronicles the author's entry into the service of the guru and the long series of events, from her point of view, leading to her disillusionment and exit. The publication of the book created a furor in India and worldwide, though Ammachi and her organization have largely brushed off the controversy (Ammachi is at this point extremely politically connected and can probably escape serious threats to her power even if the worst allegations against her are true). Tredwell alleges in her book that Ammachi is physically and psychologically abusive, has been secretly funneling money from her multi-million-dollar charities to her family, and has been lying about personal details such as celibacy. Ammachi's organization has denied Tredwell's claims. Parties connected to Ammachi have accused Tredwell of deception and mental illness. Not having first-hand knowledge of either party, I take no official stand. This said, my own astrological methods (demonstrated in hundreds if not thousands of cases in my online material) strongly support one side of the dispute. First: Ammachi's horoscope contains the Bloodbath Formula including an extremely "Dionysian" Pallas conjunction to the South Node. This is no guarantee of wrongdoing but is highly consistent with the guru's unfavorable depiction in "Holy Hell". I won't spell out the chart here, but it's easy enough to verify using one or two minor aspects. Second: The chart I propose for Gail Tredwell fits her own self-description very well. I assembled this chart from the birthday and approximate hometown location in the book, plus the year of birth from the Wikipedia article about her. Using a default time of 12 noon gives us a number of very striking house placements which work well with Tredwell's narrative. There may be other times that also work (for example, near sunset might explain some of the her health issues while arguably fitting with the narrative). Apollonian: Pallas septile Sun and quintile Mercury; Pallas ruler Venus conjunct/parallel Sun. Dionysian: Pallas in Eighth House semisextile Pluto. This is an extremely "Apollonian", or ethical, chart. This configuration is inconsistent with someone who would harm innocents for revenge or personal gain. Ninth House concentration: teaching, philosophy/religion, travel, publishing, or some combination thereof. She's done all of these. Sun/Venus conjunct near MC: publicly embodying grace and/or beauty. She apparently did this as Ammachi's public "number two" for decades. Mercury/Saturn in the Tenth House: managing and coordinating Ammachi's organization were central to her work there. 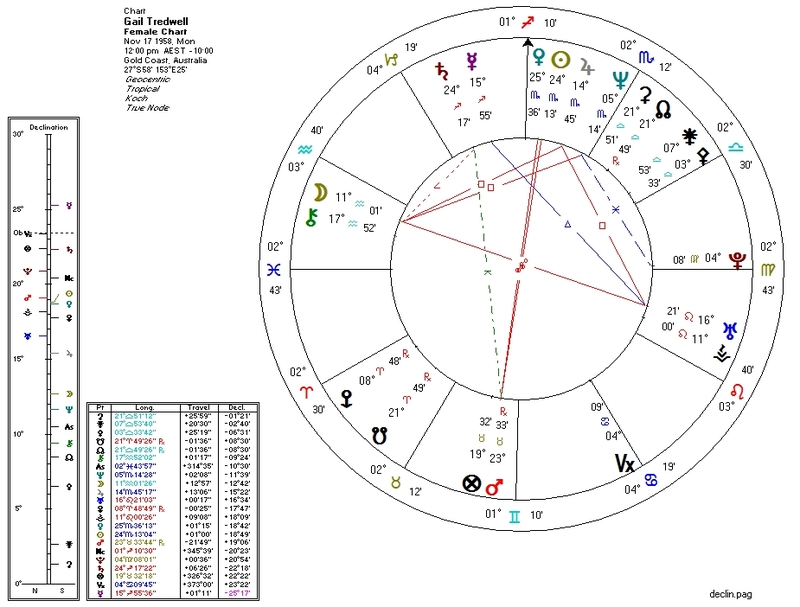 Moon in the Twelfth: emotional connection to spirituality, a spiritual "mother figure", a possible lack of nourishment, and possible deception involved in all of these. 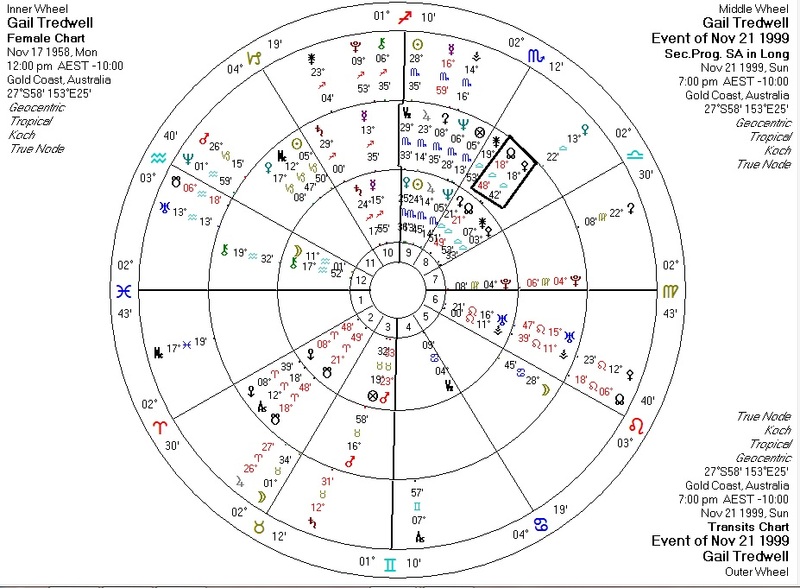 T-square between Uranus in the Sixth, Jupiter in the Ninth, and Moon in the Twelfth: tension between the rebellious servant, the secret life of the mother/family, and the public face of it all. Pluto in Virgo at the Seventh House cusp: "marriage" to an extremely powerful, controlling, potentially violent yet "virginal" personality. South Node in the Second House: the giving away of one's stuff. Repeatedly. Mars in the Third opposite Sun/Venus: sexual violence from a "sibling" is described in the book. Third: transits/progressions for Tredwell's "escape" as described in the book are also interesting. Progressed Pallas conjunction to North Node: the peak of a process lasting many years involving the awareness of ethics. Decisions coming out of this sort of aspect tend in retrospect to be on the "right side of history". This corresponds extremely well with the "crisis of conscience" Tredwell describes in her book. Transiting Mercury, Pallas, Venus, Saturn, and Uranus triggering Tredwell's natal Moon-Jupiter-Uranus T-square. Something very significant was going to happen under this configuration. Transiting Ceres sextile Tredwell Sun and progressed Ceres probably square Tredwell Moon: Ceres/Sun/Moon patterns appear when people are "taken away". All of this "proves" nothing. But were I forced to choose a side in this battle, the astrology (at least the way I practice it) would put me in the Tredwell camp. I find the entire realm of spiritual enlightenment and its purported representatives (saintly and otherwise) to be utterly fascinating. More posts on the topic may appear here, in part because I often get bored with politics. AnonymousSeptember 22, 2015 at 12:45 PM Pretty good analysis, IMO. In my experience with metaphysical matters, most of the truly spiritual and ethical folks are happy to work behind the scenes. The ones that do end up in positions of leadership, after working in the trenches, are generally content to keep plugging away; chopping wood and carrying water on a larger scale, but for the same purpose. You could continue your line of questioning in regards to U.S. evangelical leaders such as Joel Osteen and Benny Hinn. Or hit politics and religion at the same time by checking out Mike Huckabee's astro. Or just for fun, try Jim Bob Duggar. :-) ReplyDelete Sudheer KumarJune 14, 2016 at 11:10 AM What if the spiritual teacher confers distinct spiritual experiences? They're not bound to abide by our rules. I once did an Iching reading on her and it showed the double hexagram of perfect yin-yang. All male + All female. ReplyDelete Replies astrolibertarianJune 14, 2016 at 3:35 PM Good question. No good answer.